(1) There are very few telephone boothes these days. Most people use cell phones. (2) When there are phone boothes, they do not have accordion-fold doors. I thought this was to deter homeless people from sleeping in them, but someone else wisely pointed out that this is also an ADA issue. People in wheelchairs can't get into phone boothes with doors. And now, on to the lyrics! (3) There is no more picking up the phone and reaching an operator immediately. I don't think there was in 1980, either. I don't know what happens if you pick up the phone and press "0" now, but I doubt a person (i.e., "operator") answers. A computer probably answers. So operator please make their telephone ring. (4) There's no more dialing. This doesn't really count, though, since I think people still refer to "dialing" in connection with a telephone. Even though they mean "pressing little buttons." (5) It does not only "cost a dime." It costs at least 50 cents, I think. Although, really, it's been years since I've made a call from a public payphone with actual coins. Before I had a cell phone I used a calling card, because it was cheaper. But still not ten cents for the whole call. 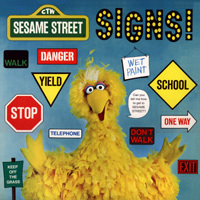 Note: Originally released on the album Signs (1977), Children's Television Workshop. Which raises the question--did operators "pick up the phone" and place calls for people in 1977?